Specially formulated for couples trying to conceive. Trying for a baby? 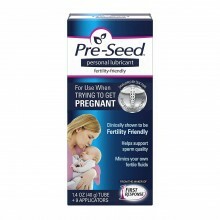 Try Pre-Seed™ Fertility-Friendly Lubricant. It not only enhances your comfort, it’s specially formulated to mimic your body’s naturally fertile fluids. The National Institutes of Health funded research to design this patented, sperm-safe lubricant formula. With Pre-Seed™ Fertility-Friendly Lubricant, you can be confident that you are using the right lube when trying for a baby. Pre-Seed™ Fertility-Friendly Lubricant is a high-quality lubricant that mimics fertile cervical fluids to support sperm on their journey. Unlike most other lubricants, Pre-Seed™ Fertility-Friendly Lubricant is pH-balanced and isotonic, so sperm can swim freely.